This is new in Deep Security 10. In the modern data center, more and more security breaches are a result of targeted attacks using techniques such as phishing and spear-phishing. In these cases, malware writers can bypass traditional malware scanners by creating malware specifically targeted for your environment. Deep Security provides enhanced malware protection for new and emerging threats through its Connected Threat Defense feature. How does Connected Threat Defense work? When all of the components are configured properly, the Deep Security Agent uses heuristic detection to analyze files on the protected computer and determines whether they are suspicious. Optionally, you can manually or automatically send suspicious files from Deep Security to Deep Discovery Analyzer, which executes and observes the suspicious file in a sandbox (a secure, isolated virtual environment). Deep Security Manager gets the sandbox analysis results from Deep Discovery Analyzer. The sandbox analysis report doesn’t provide protection; it simply provides information on the Deep Discovery analysis. For complete protection, this feature requires a connection to the Trend Micro Control Manager. The report is retrieved from Deep Discovery Analyzer every 15 minutes. Deep Discovery Analyzer pushes the analysis results to Trend Micro Control Manager, where an action can be specified for the file based on the analysis. Once the action is specified, a list of emerging threats called a suspicious object list is created or updated. Other Trend Micro products, such as Deep Discovery Inspector or Deep Discovery Email Inspector, may also be connected to Trend Micro Control Manager and able to update the list. Optionally, you can configure Deep Security Manager to receive the list of suspicious objects from Trend Micro Control Manager and send the list of suspicious objects to Deep Security Agents. Deep Security Manager is installed and configured with Deep Security Agents, Deep Security Agents protecting computers, or both. Deep Discovery Analyzer 5.5 is installed and the sandbox virtual machines are provisioned. Trend Micro Control Manager 6.0 SP3 Patch 2 or later is installed. Deep Discovery Analyzer has been added to the Trend Micro Control Manager Managed Servers. See the Trend Micro Control Manager documentation for details. To use Connected Threat Defense with the Deep Security Virtual Appliance, you must be using VMware NSX 6.x. If you want Deep Security Manager to send suspicious files to Deep Discovery Analyzer for analysis, you'll need to set up a connection. In Deep Security Manager, go to Administration > System Settings > Connected Threat Defense. Select Enable submission of suspicious file to Deep Discovery Analyzer. If you want Deep Security Manager to automatically submit files to Deep Discovery Analyzer, select Enable automatic file submission. Select Use Deep Discovery Analyzer associated with the Control Manager that Deep Security is registered with. Click Test Connection. If you get an error saying that Deep Security is unable to connect due to a missing or invalid certificate, click Add/Update Certificate to update to the correct Deep Discovery Analyzer certificate. In Deep Discovery Analyzer, go to Help > About and note the Service URL and API key. You will need these values later, so copy them into a text file temporarily. Select Manually select a Deep Discovery Analyzer server, and enter the Server URL and API key that you found in step 1. 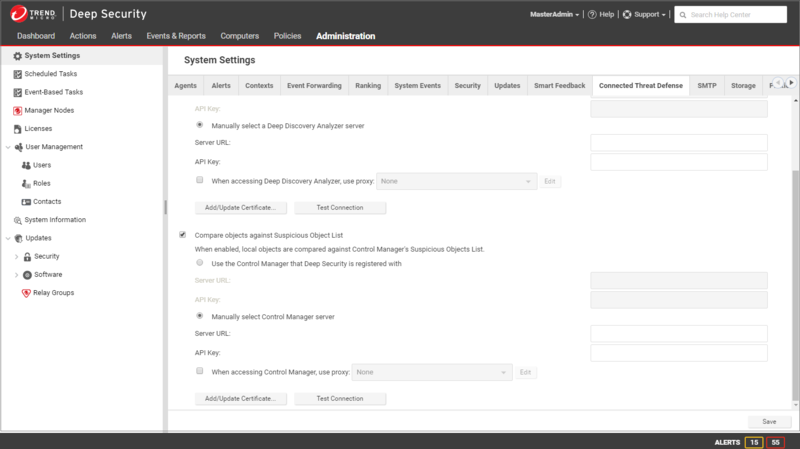 When you configure these settings, Deep Security Manager will be able to retrieve the suspected object list from Trend Micro Control Manager, share it with protected computers, and compare local objects against the Control Manager's Suspicious Object List. Select Compare objects against Suspicious Object List. If Trend Micro Control Manager is already managing Deep Security, select Use the Control Manager that Deep Security is registered with. Click Test Connection. If you get an error saying that Deep Security is unable to connect due to a missing or invalid certificate, click Add/Update Certificate to update to the correct Trend Micro Control Manager certificate. 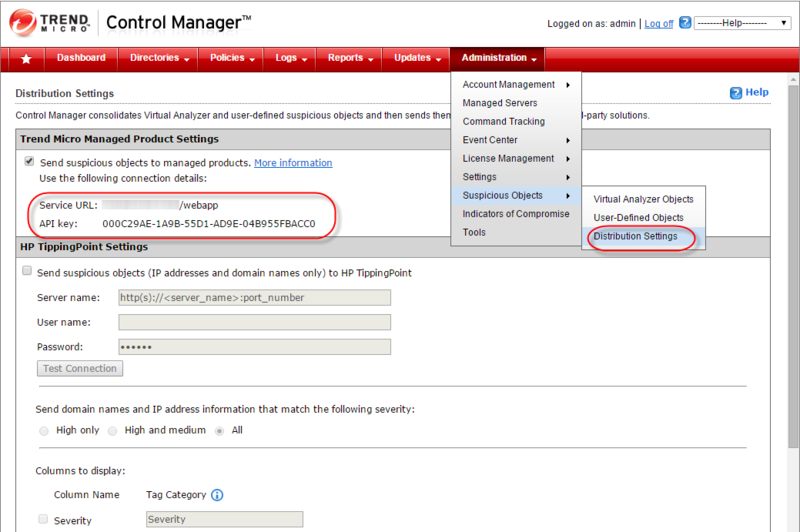 In Trend Micro Control Manager, go to Administration > Suspicious Objects > Distribution Settings. Note the Service URL and API key. You will need these values later, so copy them into a text file temporarily. Select Manually select a Control Manager server and enter the Server URL and API key that you found in step 1. The following configuration allows Deep Security to detect suspicious files, back up the suspicious files, and automatically send them to Deep Discovery Analyzer for further analysis. Create a new scan configuration or edit an existing configuration. Scan for exploits against known critical vulnerabilities only: Only detects known critical vulnerabilities. Scan for exploits against known critical vulnerabilities and aggressive detection of unknown suspicious exploits: Detects more issues but may also result in more false positives. If you want to detect suspicious files and submit them to Deep Discovery Analyzer, you must select this option. Configure the other malware scan settings as described in Malware Scan Configurations. You can enable Connected Threat Defense in policies or for individual computers. The General tab contains sections for Real-Time Scan, Manual Scan, and Scheduled Scan. (For information on the different types of scans, see Protect servers from malware in four steps.) In the appropriate sections, use the Malware Scan Configuration list to select the scan configuration that you created above. If you want Deep Security to send suspicious files to Deep Discovery Analyzer, set the option under Sandbox Analysis to Yes or Inherited (Yes). If you have set up a connection between Deep Security and Trend Micro Control Manager and you want to use the suspicious object list from the Control Manager to detect malicious files, set Use Control Manager’s Suspicious Object List (under Suspicious Objects List) to Yes or Inherited (Yes). You can manually submit files that appear on the Events & Reports > Events > Anti-Malware Events > Identified Files page. Select the file that you want to submit and click the Analyze button. Follow the steps in the wizard that appears. After the file is submitted, you can check the progress of its analysis in the Submission Status column on the Identified Files page. When the analysis is finished, the Submission Status column will display "Results Ready". You can click the Results Ready link to see details. If a file is identified as malware on the Events & Reports > Events > Anti-Malware Events > Identified Files page but you know it's not malware, you can add it to the Document Exploit Protection Rule Exceptions list on the Anti-Malware > Advanced tab of the Computer or Policy editorYou can change these settings for a policy or for a specific computer. To change the settings for a policy, go to the Polices page and double-click the policy that you want to edit (or select the policy and click Details). To change the settings for a computer, go to the Computers page and double-click the computer that you want to edit (or select the computer and click Details)..
To allow the file, right-click it, click Allow, and follow the steps in the wizard that appears. 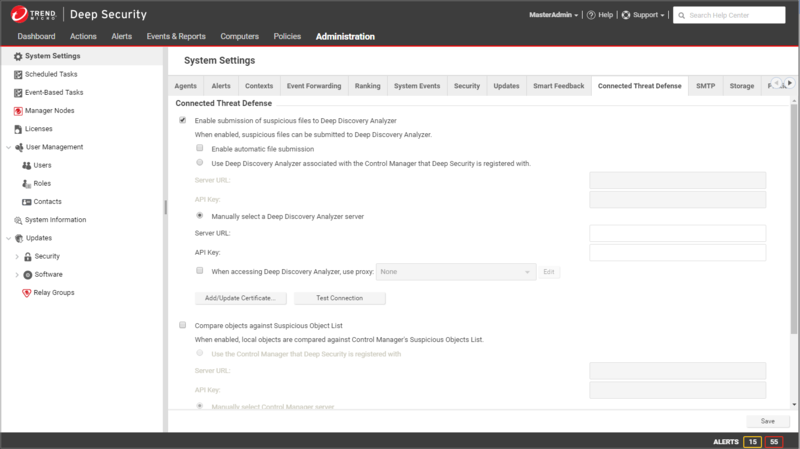 You can view the suspicious objects list in the Trend Micro Control Manager console and configure the action (log, block, or quarantine) that should be taken when a suspicious object is found. (See Suspicious Object Management and Handling Process for details on configuring the actions.) If you have configured Deep Security Manager to obtain the suspicious object list from Control Manager, Deep Security will perform the specified action when it finds the suspected object. Deep Security supports file suspicious objects. It also supports URL suspicious objects if the web reputation protection module is configured to use the Trend Micro Smart Protection Server. Deep Security does not support IP and domain suspicious objects. Trend Micro Control Manager 6.0 SP3 User-Defined Objects do not work with Deep Security. Virtual Analyzer objects for files do work with Deep Security. After the analysis of a suspicious object has been completed and the action for the file has been set in Trend Micro Control Manager, Deep Security can use the Suspicious Object list from Trend Micro Control Manager to protect your computers. To manually update the suspicious file list in Deep Security Manager, go to Administration > Updates > Security and use the controls in the Suspicious Object List Updates column to get the latest list and send it to your protected computers. You can also create a scheduled task that regularly checks for an updated list (see Schedule Deep Security to perform tasks). In Trend Micro Control Manager, the default suspicious object setting is "Log". You may want to consider changing the default setting to "Quarantine" or "Block". Once the suspicious object list has been updated in Deep Security and the computer policies have been updated with the action specified, the Deep Security Agent will then check the affected computers and use this action any time this file is encountered again on a protected computer. When the setting is enabled and a tenant goes to Administration > System Settings > Connected Threat Defense, they will see an additional Use default server settings checkbox. When this checkbox is selected, the tenant will use the primary tenant's settings. When Use default server settingsis not selected, the tenant can configure their own Connected Threat Defense settings. When the setting is not enabled, tenants must use their own Trend Micro Control Manager and Deep Discovery Analyzer if they want to use Connected Threat Defense.